causing me to exclaim, “LOOK, IT’S AN ALPACA YARN STORE!” Unfortunately we were on a schedule, but I made Greg promise we’d take a look on the way back. By the time we passed it again, it was early evening and we weren’t sure if it would still be open, but we pulled into the drive anyway. The store is a small building back behind the house; the windows were dark and there were no hours posted, so we assumed we’d missed our chance. As we turned to leave, though, a woman came out from the house. Please excuse the picture quality; we had to use our second backup camera and it does not like taking pictures inside. That’s Liz in the gray sweatshirt, and she’s telling me about their alpaca! They keep their own herd (flock? Herd.) of alpaca, about fourteen animals if I remember correctly. When they shear them they send the fleece to be spun, and they sell it in their store. 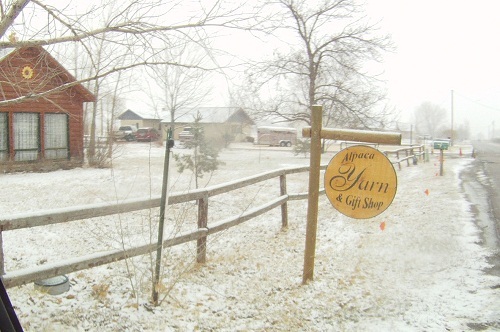 They also carry a few major brands of alpaca yarn, some roving, and a lot of alpaca related products like hats, gloves, socks, rugs, and blankets. All of the yarn and fiber from their herd is undyed, which is really cool. 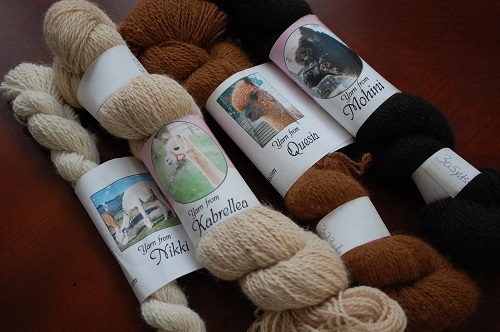 I know I’ve mentioned before that alpaca naturally produce fiber in many, many different colors. Black, brown, tan, cream, white, gray, and lots of variations. 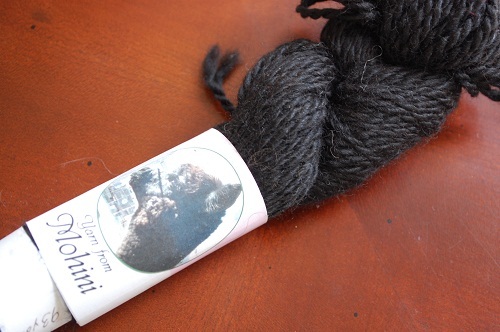 Also, they include a picture of the alpaca the fiber came from on the label. I love it! They’re pretty cute alpaca, too. So what did I get, you may ask? Another mill end, it’s pretty close to a full skein with 93 yards. And look, it’s from Mohini, just like my black laceweight! 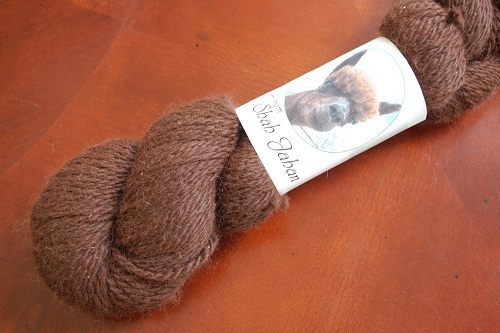 Finally, I bought a full skein of sport weight yarn in a lovely brown. Gorgeous! If you’re ever in Florence, stop by the Alpaca Yarn & Gift Shop. You can call ahead to be sure they’ll be open. (Make sure you have cash or bring your checkbook, though, as they don’t have a card-reader set up in the shop.) Not going anywhere near Colorado? You can still shop their online store and support a small family yarn business – and a very cute herd of alpaca. This entry was posted in Life in General, Yarn and Reviews. What a great score!! And even better that your husband and boys stopped for you! Wow, I had no idea alpaca came in so many colors! It looks really pretty!